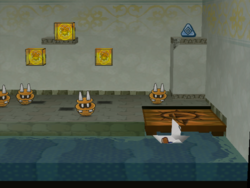 This article is about the Shine Blocks in Paper Mario: The Thousand-Year Door. For the Shine Blocks in Mario & Luigi: Partners in Time, see Adult Shine Block and Small Shine Block. For a list of Shine Sprites in Paper Mario: The Thousand-Year Door, see here. A Shine Block is a block found in Paper Mario: The Thousand-Year Door. It is a yellow block with a Shine Sprite inside it. It appears various times throughout the game. Mario must hit the block to get the Shine Sprite that is inside it. The Shine Sprites are useful for powering up Mario's partners, similar to the Super Block from the previous game. "That's a Shine block. When you hit it, a Shine Sprite pops out." This page was last edited on August 17, 2018, at 07:43.